​HOW DID U.S. STUDENTS PERFORM ON THE MOST RECENT ASSESSMENTS? Select a jurisdiction and a result to see how students performed on the latest NAEP assessments. to see the most recent reports in each subject. NOTE: DoDEA = Department of Defense Education Activity (overseas and domestic schools). Year shown with achievement-level results is the most recent assessment year in that grade and subject combination. Not all assessments are administered at all grades. For more information on each subject, click on the report of interest in the menu at​ the top of this page under the report tab.​​​ Base year indicates the first assessment year in that grade and subject combination. is the largest ongoing assessment of what U.S. students know and can do. Results from the NAEP Technology & Engineering Literacy (TEL) assessment arrive April 30, 2019! In 2018, eighth-grade students across the nation were assessed using real-world technology and engineering problems in the TEL digitally based assessment. Register today for the livestream event! Explore the latest national results in all NAEP subjects for students attending public, charter, private, and Catholic schools. Results also include percentages of student groups and students' educational experiences by the type of school they attend. Compare a state’s or district’s score to that of other states or districts in 2017. Experience the mathematics and reading assessments as students did. To view these questions, you will need to use Chrome (48 or higher). The questions are best viewed at a zoom of 67 percent. Digitally based assessments enable NAEP to report on actions students took to answer questions. 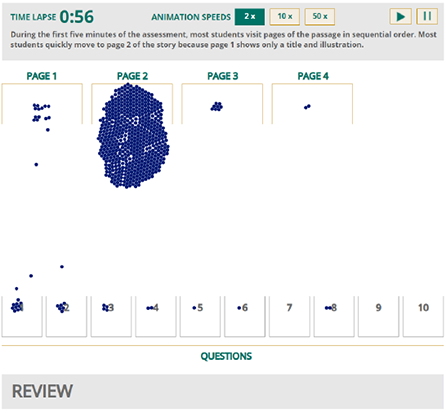 See time-lapse visualizations of how students spent the assessment time while reading passages and responding to questions during the 2017 reading assessment. This report examines fourth-, eighth-, and twelfth-grade students’ access to computers and their use of computers for classroom learning using survey data from the NAEP 2015 mathematics and reading assessments. Do Your State's Proficiency Standards Measure Up? Find key data about your state. Explore reports for districts that participate in the Trial Urban District Assessments (TUDA). See which questions students are likely to be able to answer correctly at each achievement level. Read about students’ views of these subjects using survey data from the NAEP 2015 assessments. Learn how NAEP selects schools and students for NAEP assessments.